America's Finest City was once again proudly represented at this year's World Beer Cup, where San Diegans won 11 medals, including 4 gold, 4 silver, and 3 bronze, as well as the title of World Beer Cup Champion Brewery and Brewmaster in the Mid-Sized Brewing Company category. The awards were presented at the conclusion of Craft Brewers Conference & Brew Expo America in Denver, CO.
San Diego's big winner of the World Beer Cup has to be Coronado Brewing Company, who took home the title of World Beer Cup Champion Brewery and Brewmaster in the Mid-Sized Brewing Company category, a Gold Medal for its Islander IPA in the American-Style Strong Ale category and a Silver Medal for its Old Scallyway in the Barley-Wine Style Ale category. The other medal winning breweries from San Diego County include Mike Hess Brewing Co. (Habitus - Gold - Rye Beer), Ballast Point Brewing (Sculpin IPA - Gold - Australasian-Style Pale Ale or International-Style Pale Ale; Aged Navigator Dopplebock - Bronze - Aged Beer), Alesmith Brewing Co. (Old Ale 2013 - Gold - Old Ale or Strong Ale), Societe Brewing Co. (The Pugilist - Silver - Classic Irish-Style Dry Stout), The Lost Abbey (Framboise de Amorosa - Silver - American Style Sour Ale), Pizza Port Bressi Ranch (Shark Bite Red - Silver - American-Style Amber/Red Ale), Port Brewing Co. (Hop 15 - Bronze - Imperial India Pale Ale), and Pizza Port Solana Beach (May the Port Be With You - Bronze - Other Strong Beer). Drawing the highest number of entries to date, this edition of the World Beer Cup took place on Friday, April 11, and saw 4,754 beers from 1,403 breweries representing 58 countries—a 21 percent increase in the number of entries from the 2012 World Beer Cup, which had 3,921 entries. Brewers from five continents earned awards from an elite international panel of judges at this tenth biennial competition, with brewers from 22 countries—ranging from Australia and Brazil to Taiwan and the United Kingdom—honored. Judges awarded 281 out of 282 total possible awards, reflecting the chance for one gold, one silver and one bronze award in each of 94 beer style categories. We congratulate all the winning brewers and San Diego as a whole for being such an amazing craft beer mecca. 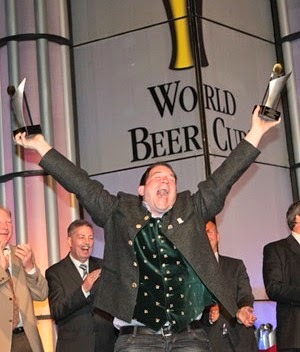 For a full list of World Beer Cup winners, visit worldbeercup.org/winners.